1. 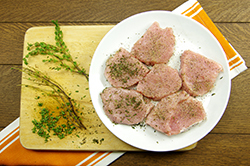 Season the pork medallions on both sides with salt and pepper. 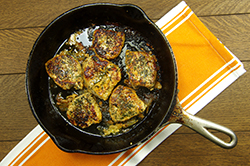 Sprinkle the thyme over one side of the pork and press down to help it stick. 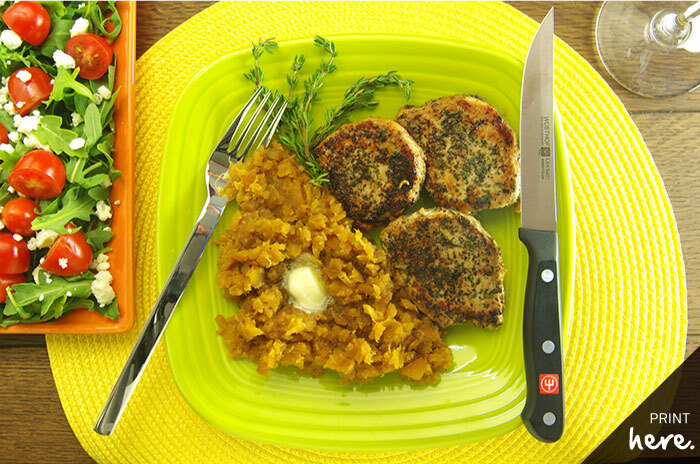 Set the pork aside on a plate. 3. 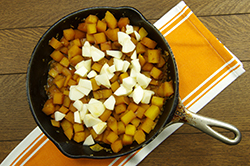 Add the rutabaga, shallot, and 1/2 tsp salt to the hot pan and sauté the vegetables for about 2 minutes to get them hot and cooking. 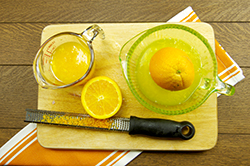 Add the orange juice and bring it to a simmer. Cover the pan, reduce the heat to low, and simmer until the vegetables are tender, about 20 minutes. 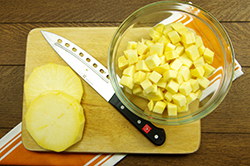 (To check for tenderness, pierce the cubes of rutabaga with the tip of a sharp knife. If they aren’t tender, cook another 3 minutes.) Uncover and stir in the pear and 2 tsp of the butter and cook another 2 minutes covered. 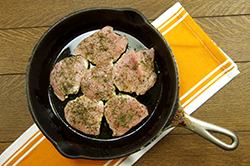 Arrange the pork medallions on top, re-cover, and cook until the pork is rosy, about 2 minutes longer. 4. 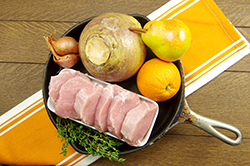 Divide the pork medallions between two warmed plates. Taste the vegetables and season them with more salt and pepper if they need it. There should be some liquid in the pan; if there’s more than 1/4 cup/60 ml, pour some of it off. 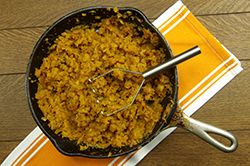 Add the orange zest and smash the rutabaga-pear mixture with a potato masher until it looks like lumpy mashed potatoes. 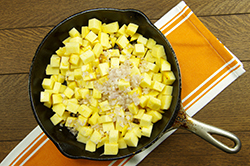 Scoop the mash onto the plates alongside the pork and dot with the remaining 1 tsp unsalted butter. Serve hot. It’s That Easy: If you’re not familiar with them, rutabagas can usually be found near the potato and onion bins at your market. They are quite large – they look like giant gold-and-brown turnips. 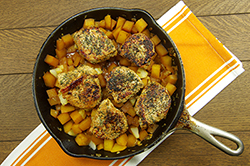 Just peel and slice and dice, use as much as you need, and store the remaining rutabaga in the fridge for another use – they add flavor and interest to pretty much any soup or stew. Extra Hungry? A salad of radicchio and Belgian endive tossed with a splash of balsamic vinegar, a glug of olive oil, and a scattering of goat cheese crumbles rounds out this meal perfectly. In the Glass: If you’ve read through a few recipes in this book, it should come as no surprise that I love pork and I love Pinot Noir. So guess what I’d want to drink with this meal? Look for a bottle from Cloudline or Castle Rock for a tasty, inexpensive glass.